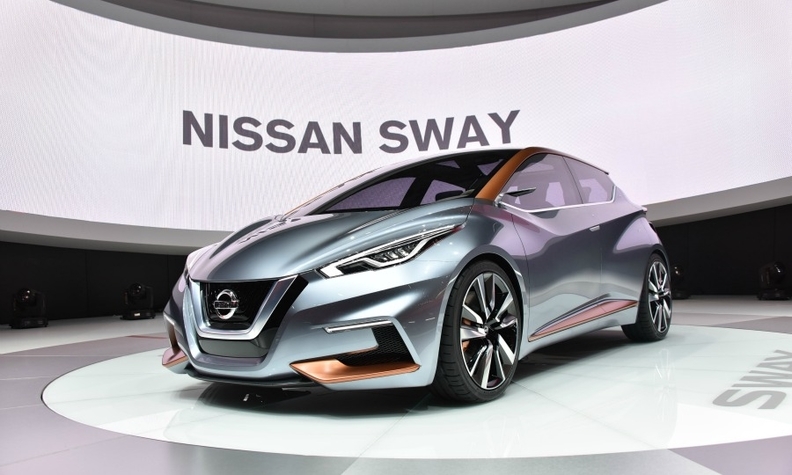 Nissan may use some of the sporty design cues from the Sway concept car on the new Micra to address complaints that the current Micra's styling is dull. The Sway was unveiled at last year's Geneva auto show. SUNDERLAND, England -- Nissan’s new Micra will have higher sales than the current car thanks to its larger size and wider range of engines, the brand’s Europe chief, Paul Willcox, said. The next Micra will fit its segment better than the current car, Willcox told Automotive News Europe. “The car will be positioned right in the heartland. We will sell more than current Micra,” he said at a press event at Nissan’s factory here. Willcox wasn’t specific about the wider engine line-up. The current Micra is available in Europe with two versions of a 1.2-liter gasoline engine. Willcox said he expects European sales of hatchbacks such as the Micra to remain strong despite the growing popularity of small crossover/SUVs. The new-generation Micra will go on sale later this year. It will be built for European markets at alliance partner Renault’s factory in Flins, France, instead of in Chennai, India. Renault is adding annual capacity of 82,000 units for the Micra at the plant, which also builds the Renault Clio and Zoe subcompacts. Nissan’s head of performance, Trevor Mann, said the Micra will be built on a hybrid platform including some elements of Renault-Nissan alliance’s new CMF-A small-car platform. The first car to use the platform in its entirety will be the next Nissan Juke, which will go into production in 2018 in Sunderland. The Micra is Nissan’s third best-selling car in Europe after the Qashqai and Juke. Sales of the Micra rose 5 percent to 61,431 in Europe in the first 11 months of 2015, according to market researchers JATO Dynamics. Qashqai sales for the same period were 214,833, up 26 percent. Juke sales increased 5 percent to 94,706.